1975: The first recorded meeting of the `Delegates' of what was to become CLANS AND SCOTTISH SOCIETIES OF CANADA was held at the Hyatt Regency Hotel, 21 Avenue Road, The York Room, on Wednesday 22 October 1975 called by John H. Macdonald. `John H.' had been Secretary of a group known as The Scots Federation of Ontario which dated back to 23 March 1965. Many of us had been involved with this loosely slung group through the Information Booth for the Scottish World Festival (begun in 1972) at the Canadian National Exhibition (CNE) Toronto. 1976: Donald called the first meeting of Delegates for 29 January 1976 , again at the Hyatt Regency. Groups added at this meeting were: Toronto Scottish Regimental Association, Highland Dancers Association Ontario, Ladies Auxilliary to the Order of Scottish Clans, Easter Canada Highland Dancers Association, Uist and Barra Scots Association, Royal Scottish Country Dance Society, Daughters of Scotland, and Gaelic Society of Toronto. At that January meeting a vote was taken to call the new organization, THE CLANS AND SCOTTISH SOCIETIES OF CANADA (CASSOC). 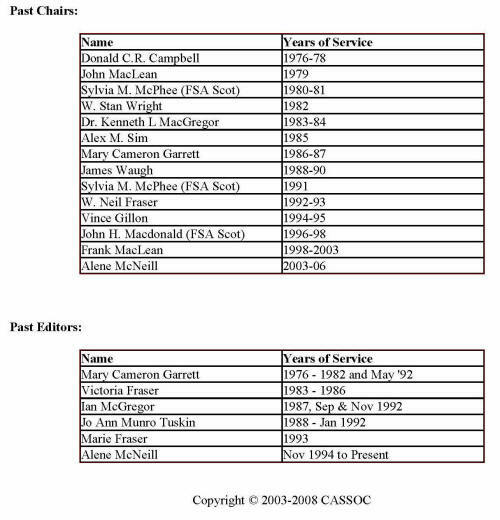 Other names, such as `Scots Canada' were considered but it was hoped that one day CASSOC would become a `household term'. A good start was made that evening on reviewing the draft constitution and it was planned that we would have a newsletter with four issues a year. The newsletter was named An Drochaid by Andrew MacNeill and the Gaelic translation is `The Bridge', linking Scots from Scotland to Canada and back. Mary C. Garrett was named the Editor. The first issue was May 1976 and it featured The Kirkin' o' the Tartan. On 29 April 1976 ,the next meeting was held at the Fort York Armoury in the Toronto Scottish Officers' Mess. At this meeting it was announced that we would have the hospitality of St. Andrew's Presbyterian Church, King and Simcoe Streets, Toronto , in a suite of rooms on the third floor of the old Institute Building at 75 Simcoe St . This was great news! This was our home until the building came down in 1987. FIRST KIRKIN': On 20 June 1976 at St. Andrew's, we held our first Kirkin' o' the Tartan with the Rev. Dr. William J. Morris, Minister of St. Mungo Cathedral in Glasgow, and he brought greetings from the Duke of Argyll, Lord MacLean, Fraser of Lovat, Dame Flora MacLeod and Lachlan MacIntosh of MacIntosh. It was a morning service and the Hon. Pauline McGibbon, Lt-Governor of Ontario , was our special guest. Afterward refreshments were served on the lawns outside the church. THE CNE INFORMATION BOOTH FOR SCOTS: Many of the Clans took part in the four days of the Scottish World Festival: MacLeod, Munro, Ross, MacLean, MacNeil, Campbell , MacPhee, OGS Toronto Branch, Fraoch Eilean, Sons of Scotland, Ladies Aux. To the Order of Scottish Clans and the Cairngorm Club. At the Festival Ball held in August on 1976, the Sons of Scotland presented CASSOC with at cheque for $500.00! A CABARET AND DANCE: was held on 25 September at the Metro Police Association Hall on Yorklands BIN., d in North York. A grand time was had by all groups who attended. Member Groups for 1976: Cairngor n Club, Caledonian Society of Scarborough, Canadian Assn of Scottish Studies, Canadian Scottish Club of Whitby, Canadian Scottish Club of Willowdale, Daughters of Scotland, Donald Council Canada, Eastern Canadian Highland Dancers Assn, Fraoch Eilean Canadian Foundation, Gaelic Society (Toronto), Halton Peel St. Andrew's Society, Highland Dancers Association of Ontario, Lorne Scots, OGS Toronto Branch, Ladies Aux to Order of Scottish Clans, Royal Scottish Country Dancers, Sons of Scotland, Toronto Scottish Regimental Assn, Uist and Barra Assn, and Clans Campbell, Ferguson, McCaughan, MacLean, MacLeod, MacMillan, MacNeil, MacPhee, Munro, Ross and Sinclair. A Gaelic Mod was held at St. Andrew's Presbyterian in April. Competitions were held for young and old in choirs, soloists, duets, reading and instrumentalists. The Gaelic Society is one of the earliest and most active members. We were saddened to have lost one of our early `stars' of CASSOC. Walter McFadyen of the Sons of Scotland died in September — at only 50 years of age! On 30 November 1977 ,the CASSOC Constitution was ratified. New members that year were Clan Matheson and the Toronto Caithness Association. 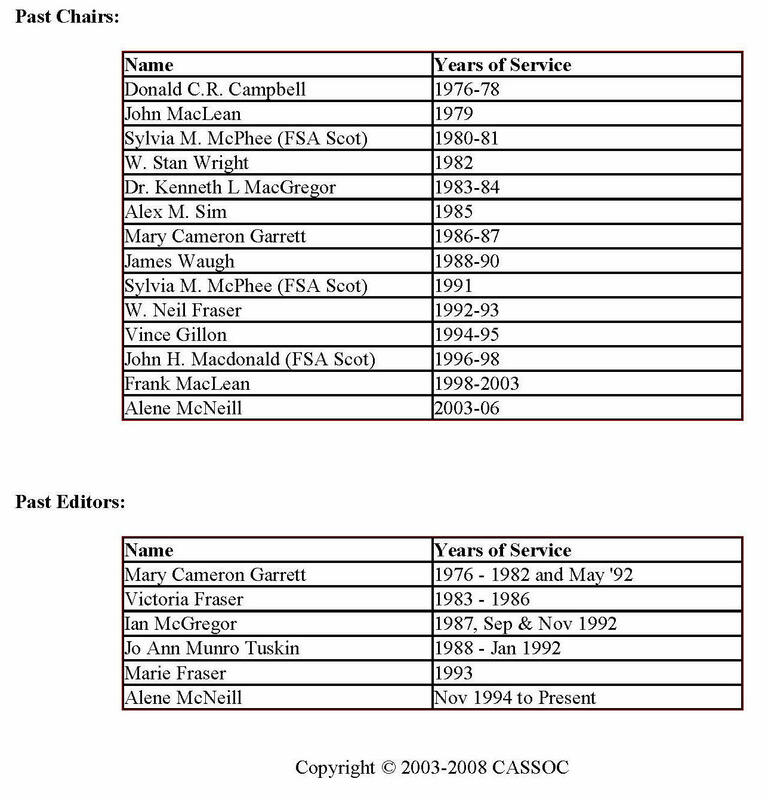 The Duke of _Argyll and Macleod of MacLeod were now Scottish Patrons of CASSOC. New Members for 1978: Assn of Scottish Tradition and Arts (ASTA), Clan Cameron Ontario Branch, 78th Fraser Highlanders, Grey Bruce Scottish Club, London Burns, Toronto Black Watch, Clan Wallace, and a corresponding member — Clan Fraser of North America. The Second Heritage Ball was held 10 February 1978 at Hotel Toronto. This was a Vice-Regal affair with the Lt. -Governor of Ontario ,the Hon. Pauline McGibbon and Mr. McGibbon as honoured guests. 1977 had been the Silver Jubilee Year for Her Majesty, Queen Elizabeth II and Prince Philip and there were medals awarded in several areas. CASSOC was given three of these medals and they were given to those whose positions exemplified our aims of co-ordination and communication. Sylvia McPhee received a medal as Executive Secretary, Fred Gardiner received one as Highland Games Co-ordinator, and Mary C. Garrett received one as Editor of An Drochaid. These silver medals were presented to the recipients by the Hon. Pauline McGibbon at the Heritage Ball. Members of the Executive were presented to HRH Prince Philip at the Royal Canadian Military Institute (just north of the hotel) prior to the Ball. At the Kirkin' on 11 June 1978 , we were to have blessed our new CASSOC standard designed by John MacLean. But since it was not ready for that day, a substitute was made by Donald Mhor's family and it was indeed blessed during the service. Later it was framed and hung in our suite. Later that year we had our new standard and still later, two more with poles and stands. During the Scottish World Festival at the CNE, a Ceilidh was held at St. Andrew's which gave those who wished an opportunity to meet Honoured Guest, The Duke and Duchess of Hamilton and the Earl of Caithness and his lady. At the AGA in November 1978, we had 39 members and we were printing 400 copies of the newsletter, An Drochaicl, for the membership. 1979: We began the year with a new Chair in the person of John MacLean of Richmond Hill, ON. Jock McLeod became 1st Vice- Chair and Sylvia McPhee took on the 21 Vice position. Moira Ross became Executive Secretary and John Peden was Treasurer. John H. Macdonald became Public Relations Convenor and other positions remained the same. 1980: Sylvia M. McPhee was elected to the Chair in January 1980. Charles Bryson was 1st Vice, John Peden Treasurer and Mary C. Garrett became Executive Secretary. Part-way through the year, Wilf Wallace became 2 Vice. Committee members were: Marjorie McLeod, Fred Gardiner, Norma Fraser, Gloria Ross, Alex Taylor, Jock McLeod and Col Gordon Leggett. Bill Cockburn became the Hon. Piper, Rev. Fr. Joseph McCormick became our R.C. Chaplain in June, and Lt-Governor Pauline McGibbon became our first Canadian Patron on 22 October. On 15 March 1980, Sylvia McPhee was interviewed on Tom Milsop's MTV show and she talked about CASSOC's activities and history. In April, we increase the publication of 4n Drochaid to 5 issues per year. The Kirkin' o' the Tartan was held at St. Andrew's on 8 June with Rev. Prof. Charles Scobie of Mt. Allison University in New Brunswick, as special speaker. There was a picnic for all on 14 September, again at Fort York in Toronto. New members in 1980 were: The Burns Society of Toronto, Clan MacDougall, St. Andrew's Society of Timmins and the University of Ottawa Celtic Chair. The Heritage Ball was held on 24 October at the Seaway Towers Motor Hotel with Lt. Gov. Pauline McGibbon and Mr. McGibbon along with Dr Herb and Ethel MacNeil, President of CGSCAI (USA), as special guests. We were shocked and saddened before the Ball was over because of the sudden death of John R. Chevalier McCaughan. A motto for CASSOC was established — COMHLA ri CHEILE — Meaning `together with Accord'. Mod Ontario was a grand success with Andrew Ogg winning the Lt. -Governor Award and he went to Portree on Skye to compete in the National Mod. Marlene Finnucan of Kingston won the CASSOC Walter McFadyen Award. The Kirkin' o' the Tartan was held at St. Andrew's on 13 June at 3:00 p.m. Dr. Douglas Stewart was the speaker. Long tartan banners had been made by most clans to be used as decoration at Ceilidhs and Heritage Balls and they were dedicated at this Kirkin'. We looked at a building on Lakeshore Rd (now the Army, Navy and Air Force) near the Boulevard Club. We could have had it for a `song' and it would have cost us about $51,000 for the first year to run it. There was not enough interest for the Clans didn't have the money! It had been a Shriner's Temple. The Spring Ceilidh was held at Earl Bales Community Centre on 14 April and was another financial success ($368.74). The biennial Kirkin' was held on 10 Jun at 3 p.m. at St Andrew's. More changes were made to the Constitution. There were 54 members at Year End — we had gained a few and lost a few! Some meetings in '85 were held at St Andrew's and the rest at Fort York Armoury. We began again to talk about a proposed Cultural Centre for Scots. There was a new government program called C-FIP (Community — Facilities Improvement Program) that might be of help. CASSOC had to meet requirements and we could receive up to 50% of our needs. We had to raise the balance. Don Ross headed the Committee. At the Kirkin' on 8 June, Dr. Stewart was the speaker. 1987: The year began with Mary Garrett as Chair and neither Vice position had been filled. Ian McGregor became Editor, Don Ross resigned the C-FIP committee and his 2nd Vice position. Lt. Col. Jim Parker of the Tor. Scots. assumed that role as well as becoming Chair of the C-FIP committee. But Jim Parker found it necessary to resign as well. The Executive called a special meeting to decide to put the feasibility study on the `back burner'. Then Grace Scott caught the `bug' and resigned as Executive Secretary in May. Jeane Campbell did the recording during May and Carol Ann Woodworth became Executive Secretary in September. We had to leave St. Andrew's at the end of May because of the renovations and from then on we met at Victoria Royce Presbyterian Church (in the `Junction' area of Toronto). An Inventory was taken of the CASSOC `belongings" (furniture, files, cabinets and such) in our suite of rooms in St. Andrew's. These things had to be removed from the Institute building as it was being demolished for renovation. The Inventory was stored with the Treasurer. In December of 1988, there was a terrible Pan .Am air disaster over Lockerbie, Scotland, and many lives were lost. CASSOC had a call on our telephone service asking the organization to take on a fund for the families of the Scottish victims. Jim Waugh, Stan Fleming, Jeane Campbell, Sylvia McPhee and Mary Garrett were immediately on the planning. With the Chartered Banks and the Canadian Red Cross we were able to present a cheque for $53,000. On 10 February 1989, we received a congratulatory letter for Argyll (one of our Scottish patrons) for our effort and also CASSOC was awarded a citation from the Canadian Red Cross for "outstanding efforts and leadership in co-ordinating disaster response activities through the Red Cross on behalf of the victims of the air disaster at Lockerbie, Scotland." At the March Assembly, it was moved, seconded and passed, that CAS SOC would furnish St. Andrew's Church with a new board room table to commemorate the Church's contribution to the foundation of CASSOC and as a tribute from the Scottish Community we represent. The budgeted value of the table is $4200.00 which includes the cost of a suitably inscribed plaque and the applicable taxes. It was hoped that the Development fund would not be touched so that it would continue to grow for its original purposes, but that perhaps some of the monies withdrawn from the feasibility study might be turned back to the Table Fund. Mod Ontario wrote to CASSOC that they were having some problems and some changes were being made regarding the Mod Event and they wanted to return to us the Walter McFadyen trophy. It was decided that the trophy would be given to Rhoda McRitchie for safe-keeping. Mrs. McRitchie was Mod President that year and the trophy was presented to her at the September Assembly. 1991: Sylvia McPhee was elected as Chair; 1st Vice was Alene McNeill; 2nd Vice was Vince Gillon; Treasurer Stan Fleming; Mary Garrett Executive Secretary; Debbie Wilson Recording Secretary; Jo -Ann Tuskin Editor of An Drochaid. The St. Andrew's Board Room table had been chosen at a cost of $4,151.50. 1992: A New Chairman in Neil Fraser; Vince Gillon is 1st Vice; no second Vice; Stan Fleming Treasurer and Catherine MacLean became Executive Secretary.